Showed at the start of the game. "Why is the window so small? 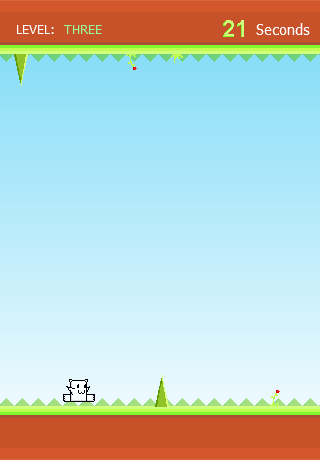 The game is currently being built in an iOS Resolution as I plan to port this game for Windows and iOS once it is completed. Testing will only be available for Windows. "Why wont anything show up in the Crafting Toolbar?" Make sure an item is selected in your inventory to build from. Also some objects require an Anvil. Please check the Cheat Book for further guidance. "I am getting Thirsty!! what can I drink?" "Is this how the final game will look visually?" Heck no! The world has not been built yet and is purely a test area. "Why can I not progress past Level 5?" More levels are still currently being built in as I am focusing on more important aspects of the game, However levels can go beyond 5 using Cheats. "Why is there large blocks of resources at the bottom of the map?" Because it is fun to do this..
"Can I donate to support this project?" Flip now on the App Store! 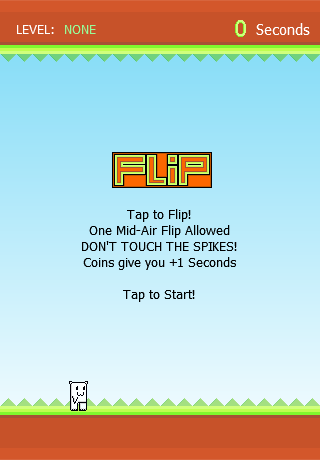 Test your skills in Flip by Running, Jumping and Flipping over Spikes for as long as you possibly can. Get rewarded with medals for your efforts and test your skills with friends and family! Do you have what it takes to achieve the greatest medal? Flip provides simple and fun gameplay which goes for an infinite amount of time for free. It is suitable for all ages and is easy to pick up and play for endless amounts of fun and is just one tap away from gameplay.